Marshmallow Fluff Fruit Dip is an easy dessert recipe that contains just two ingredients. Marshmallow creme is whipped together with Philadelphia Cream Cheese, offering an easy fruit dip perfect for your next party. It takes no more than 10 minutes to whip your marshmallow cream cheese fruit dip together, making it a perfect desert recipe for when you’re invited to a party last minute. Marshmallow dip is a perfect crowd pleaser as a rainbow of fruit and crunchy cookies make it appear like edible art. Marshmallow creme is a marshmallow confectionary spread similar in flavour to solid marshmallow or meringue. Marshmallow creme ingredients include corny syrup, sugar syrup, vanilla and egg whites. In the beginning of the 20th century, Archibald Query, a resident of Massachusetts, started selling his own version of marshmallow creme door-to-door. Soon afterward he sold the recipe to two local candy makers for just $500. The product first hit grocery store shelves in cans as Toot Sweet Marshmallow Fluff in 1917. The first two words were dropped after the packaging changed to jars in the 1940s. Today, marshmallow creme is produced by three companies in North America: Durkee-Mower’s Marshmallow Fluff, Kraft’s Jet-Puffed Marshmallow Creme and Solo’s Marshmallow Creme. Marshmallow Fluff Fruit Dip: this easy recipe offers the sweet fluff of marshmallow combined with the creamy tang of cream cheese. The Fluffernutter: is a sandwich made with peanut butter and marshmallow creme, usually served with white bread. Fudge: the container has a “no-fail” recipe for chocolate fudge printed on the side. Icing on Desserts: if you’re looking for a creative way to add icing to the top of a cupcake or filling for a layered cake try spreading marshmallow creme instead of 7 minute icing or buttercream. 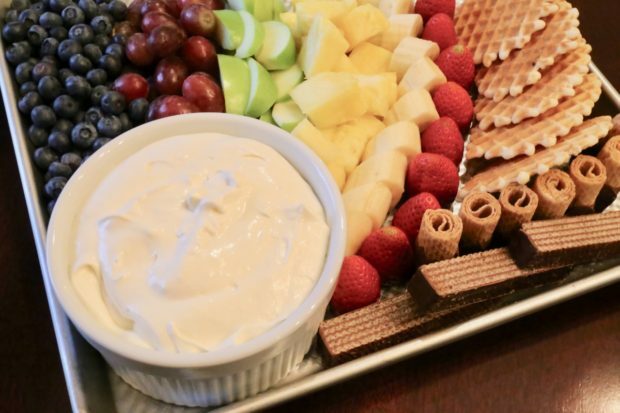 Marshmallow Fluff Fruit Dip served with fresh fruit and wafer cookies. When To Serve Marshmallow Fluff Fruit Dip? I could honestly eat marshmallow cream cheese fruit dip every morning for breakfast. It’s that addictive. Marshmallow fluff fruit dip was the first recipe my mom taught me how to make as a kid. It’s a perfect recipe to make with young kids as it doesn’t require sharp knives, heavy equipment or the use of a hot stove. My mom would make marshmallow dip whenever we were going to a big social gathering. Because Marshmallow Fluff Fruit Dip is so easy to make last minute, it’s my go-to whenever I’m going to a potluck party. My Philadelphia cream cheese fruit dip is very popular at parties. I always find people loitering around the table, wiping the empty bowl with their fingers, and asking for the recipe so they can make it at home. 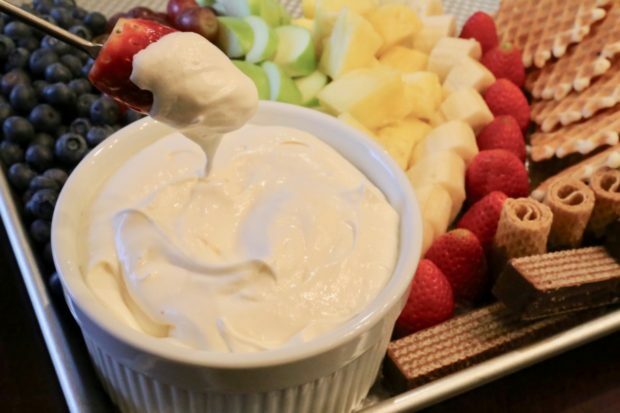 Last Minute Dinner Invitation: if you’ve been invited to a dinner party last minute, Marshmallow Dip Fluff Fruit Dip is the perfect go-to recipe. It takes no more than 10 minutes to prepare! Potluck Party: I love going to potluck parties because it allows me to get a taste of the creative culinary minds of my friends. There’s no better way to impress than serving a gorgeous fruit platter paired with finger-licking-good classic marshmallow fruit dip. Game Night: the most common snacks at super bowl parties and other sports related gathering tend to include super salty and high fat dishes. Bring a platter of fresh fruit and marshmallow dip and you’ll find your contribution hits the ball out of the park! 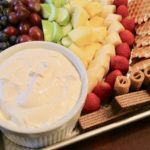 Special Celebrations: marshmallow fluff fruit dip is the perfect addition to your next Christmas party, New Years Eve Party, birthday party, Baby Shower, Bridal Shower, Easter Dinner, or Mother’s Day Brunch. I also love serving marshmallow cream cheese fruit dip at the cottage in the summer. It’s the perfect mid-afternoon snack enjoyed while lazing on the dock. 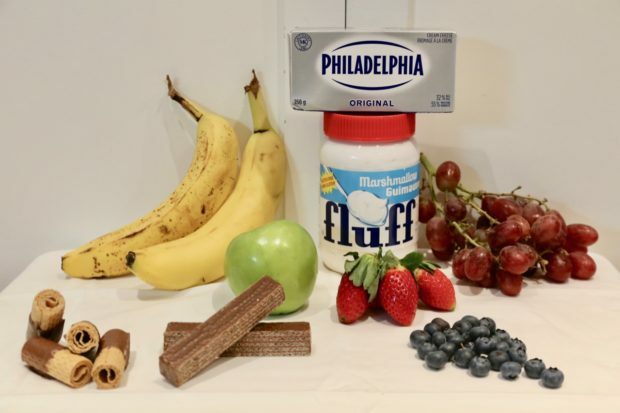 Ingredients for Marshmallow Fluff Fruit Dip. The most popular fruit to serve with marshmallow dip is strawberries and sliced bananas. Guests always seem to finish these fruits the fastest as they pair so well with the creamy tang of marshmallow cream cheese dip. If you’re preparing this fruit dip recipe for the first time remember that presentation is everything. When shopping at the grocery store ensure you’re buying the freshest fruit and be sure to take into consideration all the colours under the rainbow! You can serve your marshmallow fluff fruit dip in a large ramekin surrounded by beautifully decorated fruit and cookies. Or if at a more intimate gathering, scoop the marshmallow dip into a fondue pot. Give each guest a long fondue fork when they arrive so they can have fun stabbing each piece of fruit before swirling in your classic marshmallow cream cheese dip. Blueberries: I buy the plump variety so they don’t get lost in the dip. They add a lovely touch of blue to the fruit platter. Red Grapes: offer a crunchy and juice texture while adding a splash of purple to the plate. Be sure to purchase seedless grapes so your guests don’t choke! Apples: I like to use Granny Smith to add a touch of green to the presentation. Pineapple: slice up a pineapple to add bright yellow to your colour scheme. Pineapple’s tang is a nice treat when covered in marshmallow cream. Banana: slice a few bananas for a more subdued creamy yellow. Make sure you slice your bananas into thick chunks so they don’t fall apart in the fruit dip. Strawberries: you’ll want to buy as many strawberries as possible as they’re the most popular pairing. Snip the stems and enjoy the rich red of your fruit rainbow. Wafer Cookies: I always like to finish my marshmallow fluff fruit dip arrangement with a selection of artisanal wafer cookies. Strawberries pair perfectly with creamy Marshmallow Fluff Fruit Dip. Apples and bananas tend to brown quickly. Once they’re exposed to air they undergo a reaction, but you can circumvent the fruits unsightly discolouration by tossing them in freshly squeezed lemon juice. I prefer to cut the fruit just before serving, so if you’re heading to a potluck leave yourself some time to slice your bananas and apples upon arrival. Once you’ve mastered the classic marshmallow fruit dip get creative in the kitchen by tweaking the recipe to suit your celebration. Yogurt Fruit Dip: if you’re looking to add healthful benefits to your marshmallow dip add a few tablespoons of yogurt. Start by using your favourite plain yogurt, adding a few tablespoons at a time until you’ve found the desired taste and consistency. You can also use flavoured yogurt such as strawberry, banana or blueberry. Flavoured Cream Cheese: you can similarly add a fruity twist to your marshmallow dip by swapping out regular Philadelphia Cream Cheese with flavoured varieties such as pineapple cream cheese or strawberry cream cheese. Marshmallow Fluff Fruit Dip is an easy dessert recipe that contains just two ingredients: Marshmallow Cream and Philadelphia Cream Cheese. Combine room-temperature cream cheese and marshmallow creme in a medium sized mixing bowl. Beat with an electric egg beater until smooth, approximately 5 minutes. Serve with your favourite fruits and wafer cookies.